Saturday was a gorgeous day here in Colorado, the sun was shining, the roads were dry and temperatures peaked out in the low 60's! Definitely riding weather! Heck, it was so warm I saw many cruiser riders out, enjoying the warm temperatures as they rode along without helmets. 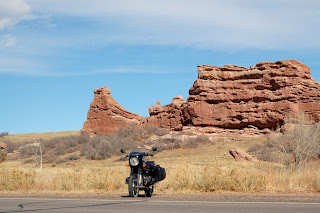 I had business in the Denver Tech Center in the afternoon but I managed to work in about two hours of riding up and down Deer Creek Canyon Road on the west side of the Denver Metro area beforehand. 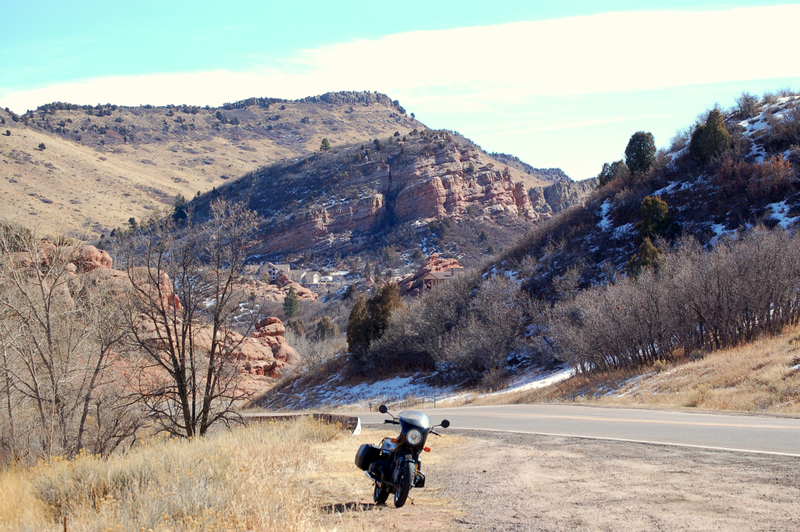 Deer Creek Canyon has its twisty stretches but there was also the dreaded patches of sand and gravel left behind from the last snow storm's snow clearing efforts by the county. Still, I was able to get some enjoyable curves here and there, basking the interplay of light and shadows as the sun penetrated sporadically into Deer Creek Canyon. Pictures done, rode back into town and got my tasks done. 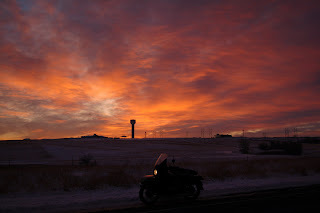 The ride home at 4PM was in the 50's in terms of temperatures with steady drops as the sun went lower into the horizon. I'd doffed all my warm layers and felt a bit chilled as I got home. Still, a good ride of about 80 miles or so, it helped shake off a bit of the blues I'd been feeling all week. Hope you got a ride in! The end of January for a brand new year approaches and I've not ridden every single day of the month. 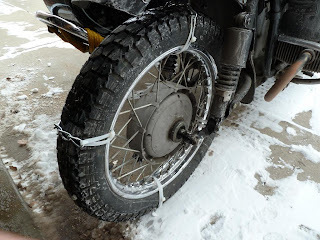 It's not because of my current mechanical issues with Natasha, my Ural sidecar rig. It's not because of snow-covered or ice-covered roads as Colorado is actually enjoying quite a mild winter so far, as opposed to the East Coast states. It's not because of lack of time or opportunity for short rides, heck, for that matter, long rides on the weekends. 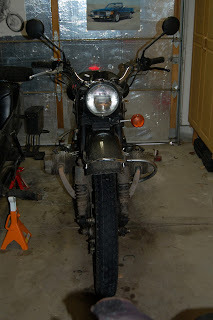 It's not because of lack of motorcycle to ride, as my Brigitta, the R80 Beemer Airhead stands ready and willing. Maybe its because that even though the roads are clear, there's no places to go during the weekdays with worthwhile scenery; I live after all near the eastern plains of the front range; and one can only go so far within one's lunch hour even when "working from home" or telecommuting. Maybe its because all the really nearby stuff has been visited over and over during short rides taken "just to be riding". Maybe its because the weather has been so "nice" that it's not much of an adventure. Sure, I've ridden to and from work in temperatures that kept most riders from riding, but its riding to and from work along the same boring path. Maybe its all the research I've been doing on possible alternatives to the Ural, most of which are not panning out which have me thinking of other motorcycles to "inject" some newness to the rides. All I know, is that being able to say I rode every day for the year 2011 is now not possible, but the worrying thing is "I don't care". Not that I don't like to ride, far from it, but now the "urge" is somewhat controllable. Today, after a week of research, weighing and comparing options available to me in terms of either fixing or replacing Natasha's final drive, I finally decided to at least look at the innards of the final drive and judge for myself the extent of the damage. As you might have read from my previous postings, I'd been unable to remove the axle from the rear or "pusher tire" and therefore couldn't remove the wheel in order to get at the final drive assembly. It was well and truly stuck in there, and repeated hammerings accomplished nothing but damaging the threaded end of the axle. Today, Oscar, a friend from work and my now best wrenching friend, came over with his tools. 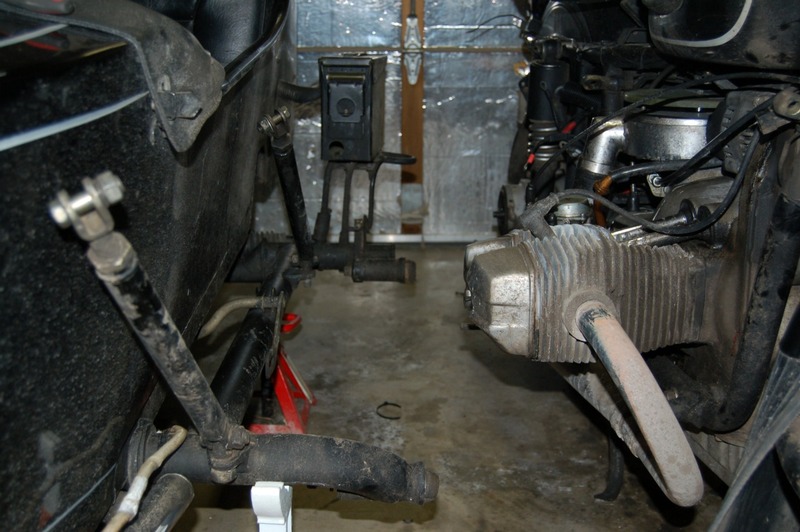 The first order of business was to cut the outboard end of the axle, as close to the wheel hub as possible. Once the loose section of the axle was removed, we could then slide the wheel with final drive still attached to the left. This would thereby free the mounting bolts which secure the FD to the right side swing arm mounting holes. 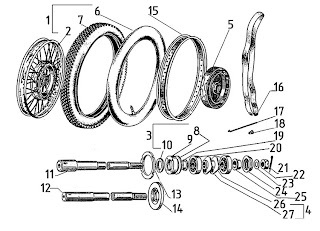 Once free of the mounting holes, the only thing holding the final drive to the motorcycle would be the prop shaft which mates it to the rubber donut which mates it in turn to the transmission. The stub in the left swing arm's pinch bolt was being difficult in its own right, but Oscar's slide hammer made quick work of that. Now came the fun part and the inspiration for the title of this posting. Using a breaker bar, I managed to push the final drive to the left and off the mounting holes of the swing arm. 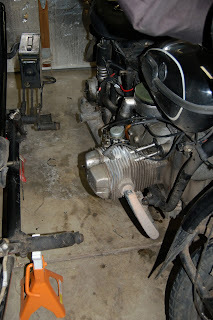 Now, the wheel and final drive assembly were only connected to the motorcycle via the prop shaft to the transmission. 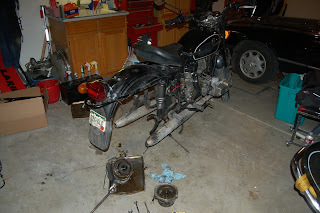 I loosened the prop shaft from the donut and while Oscar basically dead-lifted the entire rear end of the motorcycle, I wrestled the final drive free of the portion of the donut which connects it to the transmission. Oscar continued to hold the motorcycle's rear end in the air and I slid the wheel and final drive out from under it. I then took the wheel off and we rolled it outside to examine it. The axle remained stuck in the wheel hub and since it was toast anyways, Oscar then hammered it out. We noted a groove had been "cut" into the axle so it was toast regardless. So, what cut that groove you ask? I'll tell you. 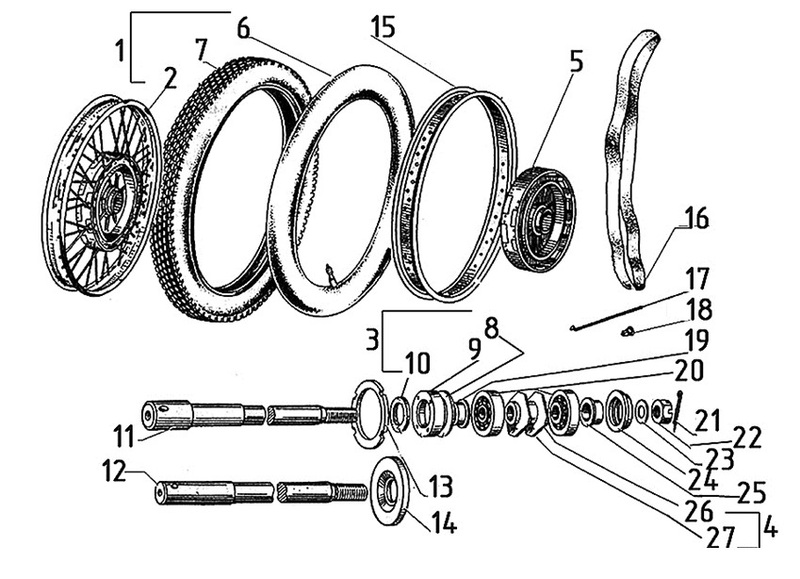 Part number 20 in the picture above depicts the two roller bearings into which the axle, p/n 11 above, is inserted. They ride on both ends of p/n 27 which is a bushing. The inner roller bearing had apparently seized and basically shredded itself to pieces inside the wheel hub. In the process of doing so, it seized the axle (probably where the slight groove was cut) and prevented me from pulling the axle as normal. 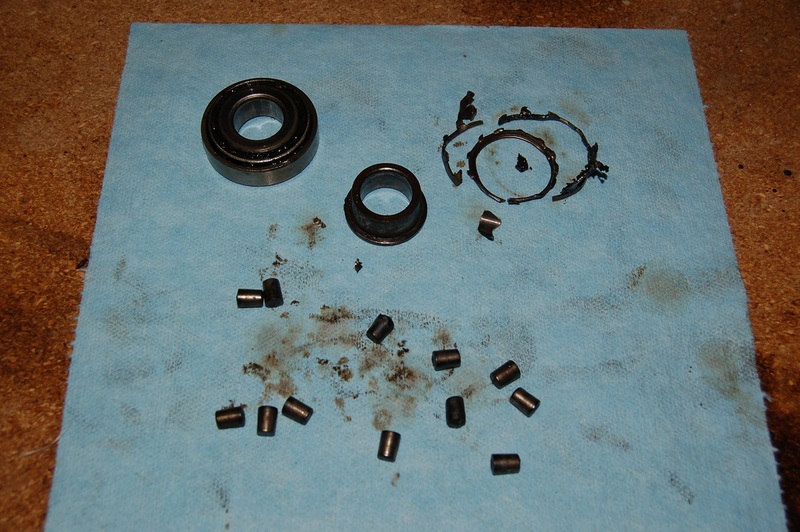 Here's the two roller bearings in question, the whole one is the outer bearing. The one in pieces, used to look like the one in the upper left corner. Nice huh? Here's the final drive, cracked open for your viewing pleasure and for my eventual disassembly to inspect for damage and replacement of parts as required. As a portent of hope, all the gears spun smoothly within their respective housings. I could move them with easy with my fingers, and by using the prop shaft. So hopefully, no major damage to the final drive components themselves! 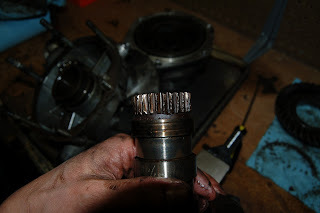 The driven gear spline, looks pretty bad to me, and probably the cause of the stripped wheel hub splines. I continued on for a bit more but stopped to take a break. Pictures were sent to the Ural dealer for price quotes, we'll see what the totals entail. It might be cheaper to replace the whole final drive with one of the newer ones which are better and more reliable. Though a new one won't be full time 2WD, it will come with engageable 2WD. We'll see. The above start of repair efforts does not mean I've discarded the notion of perhaps replacing the motorcycle with a different tug. Or finding a new rig to take Natasha's place. All options remain on the table, to include as I mentioned, getting a new Ural Final Drive. That is one thing about Urals, the design has changed so little in over 40 years, that a 2010 Final Drive bolts right onto a 1996 frame and transmission! Truly amazing all the knowledge I was lacking when it comes to mating a sidecar to a motorcycle. 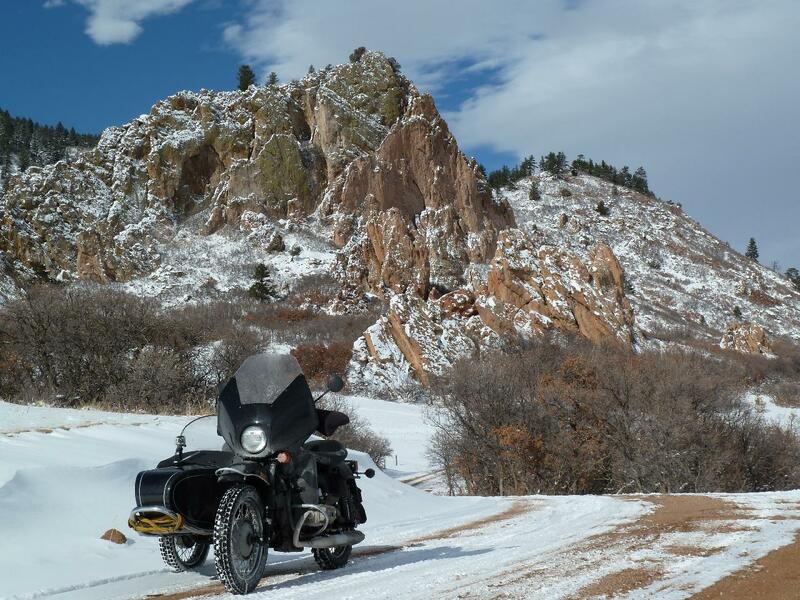 I knew that I'd bypassed such lack of knowledge back when I first started thinking of buying a Ural Sidecar Rig. I figured that since they build their rigs from the ground up to be sidecar rigs, that all the details of mating such things together would be designed in and worked out. For the most part, I was proven right with the Ural rig I rode for almost 18 months. 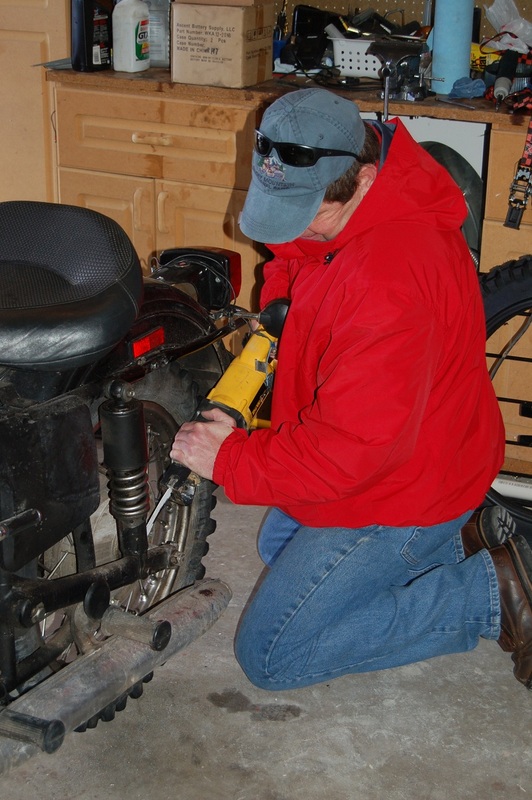 No need to mess with the alignment, or necessitating a subframe mount on the motorcycle to use as mounting points and as a bonus, they sport the capability to go into reverse and offroad with minimal hassle. 1. I am going to need a reinforcing subframe mount that gets attached to the R80, to provide mounting points for the sidecar and it's frame. You can buy something pre-made and have it shipped to you for assembly but there might be some welding and cutting involved to make it all come together. Roughly $1000. 2. You can ship your motorcycle and sidecar rig to PA where an outfit called cstanley motosports will handcraft and assembly together to mate your motorcycle and sidecar together. You'll lose your motorcycle while they work on it of course, roughly 4-6 weeks assuming nothing weird is encountered or their workload is too heavy. 3. 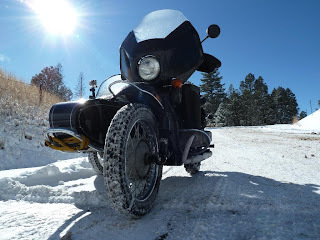 The value of the Ural tug in terms of parts and the rarity of my sidecar due to it being designed for a fulltime 2WD tug apparently exceeds her current book value as a whole motorcycle sidecar rig! In talking to other mechanics/dealers, they've expressed interested in the final drive, as broken as it is...the 750cc engine is apparently of value as well since a new one will run you $5k or more. The sidecar, when new and without all the extras it's got on now, ran $4200 for just the tub and wheel! 4. 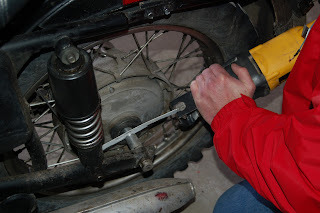 If I keep the Ural sidecar, I'll have to buy a way 1WD swing arm that bolts onto the sidecar frame to secure the sidecar wheel to the sidecar, that job is presently done by the propshaft that connects the sidecar wheel to the failed final drive. That obviously goes away with a different non-Ural motorcycle tug. 5. And, if I was to pour more money into Natasha, her broken final drive can be replaced as a "bolt on" operation for about $900 or so with a new final drive with engageable 2WD. This option however will face resistance from my loving wife in terms of "what, more money down that particular money pit?". 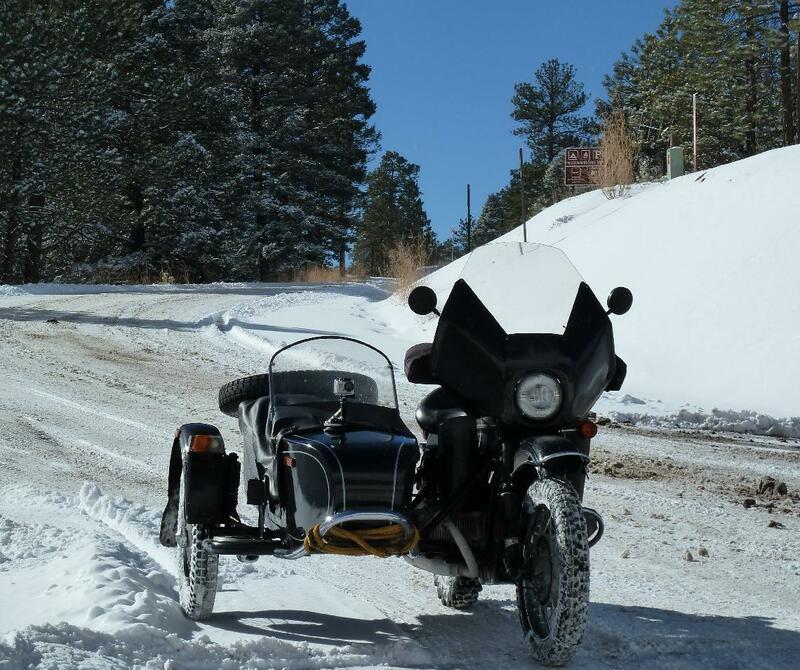 The benefit of course of keeping the sidecar in some sort of fashion is retaining the ability to go offroad with relative ease though getting stuck will be far easier with the loss of 2WD. Riding on snow though should still be doable and the R80 should be able to move things along at 70-75 mph all day long. Finally the option to carry one of my family as a passenger. Keeping up with highway traffic while attached to a sidecar, what a concept. So the above mess of data and options will continue to swirl about my head. In preparation for the hopefully soon sale of Natasha as a parts motorcycle, I separated her from the sidecar this morning. It was not as complicated or difficult as I feared. since she left the factory. Natasha as a solo motorcycle. 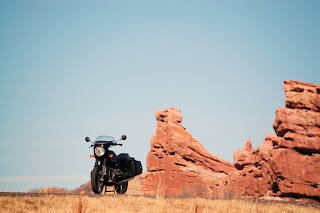 Before you even ask, I've read and have no reason to disbelieve that trying to ride the motorcycle without a sidecar can be difficult as she's got leading link forks which are great for steering a sidecar but not so great when it comes to a solo motorcycle. I've also received marching orders from my loving wife to procure a second motorcycle to use as spare while I figure out the above. She's great isn't she? I'm thinking a GS, which model, I don't know. Some would say the 1150/1200 series but their heavy bulk could make offroad adventures more "interesting" and involving heavy lifting operations than I want. 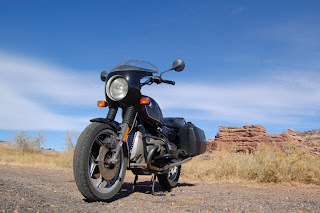 The F800s are not much lighter and I read of folks riding around the world on the 650GS which are much lighter. Given all the above, your feedback would be appreciated. My adventures with Natasha, my '96 Ural Sidecar rig have come to an end. During a ride to the hardware store during lunch yesterday, she started emitting a loud metallic rubbing noise, very similar to what I'd experienced before when the splines on the wheel hub of the pusher tire had stripped; and there was no force able to be applied to the rear tire. Later on that afternoon, once my shift was over, I tried to remove the rear wheel on the tug (that's what sidecarists call the motorcycle portion of a sidecar rig). I've done this many times before, both to swap out tires, wheels and do services. This time, the axle was not coming out. I could barely, with much force and using the tommy bar as a lever, even get it to rotate! Removed the sidecar propshaft from the FD and pounded on the axle from the right side. No luck and I damaged the threads while doing so, which should give you an idea of how hard I was hitting it with the BFH. 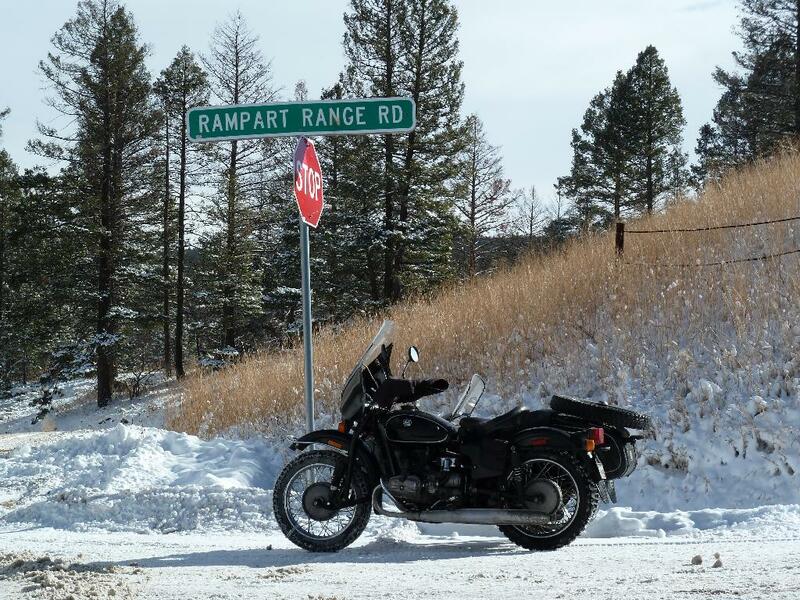 While long range plans in my head had included someday replacing the Ural tug with my '87 R80 Beemer Airhead, I had been planning on it being done AFTER this Winter. What is it that they say about the "Best laid plans of mice and men"? Or in Mr Riepe's case the "best laid mice of men and plans"? Some phone calls later, my decision was made, try and sell the tug as a parts motorcycle to the local Ural mechanic: Linden Engineering up in Golden, CO; and start the process of obtaining the right subframe mount and parts to mate my R80 "Brigitta" to the sidecar. Further on down the road, figure out a way to afford a GS type BMW for two-wheeled motoring. It's kind of sad and dissapointing in a way, but I think in the back of my mind I knew this day would come. If nothing else, Natasha's sometimes questionable reliability precluded the really long distance rides I wanted to do with a sidecar. I've been lucky each time she had issues, I was close to home and not up in the mountains. 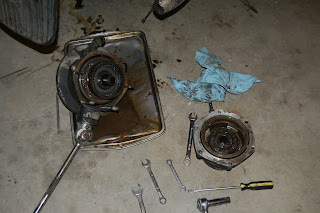 Update: 31JAN2011: So, the damage was mostly in the wheel hub. Replacing the driven gear hub in the final drive which was eating the wheels, replacing seals/bearings. We'll see if I can repair her for now. 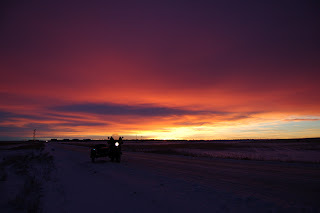 I saw a beautifully fiery red/orange sunrise starting to peek over the horizon as I motored along on Natasha, my Ural Sidecar rig. The tower structure is the water tank at the Arapahoe County Fairgrounds. Yesterday was a long day of riding to and from Cañon City, Colorado. The purpose was to test out the GoPro HD video camera's capabilities along this road which spans the top of a set of ridges just west of the town. Cañon City also has several prisons around it and is the site of the Colorado Territorial State Prison founded in 1871; so if you're curious about such things, there's a prison museum there as well. 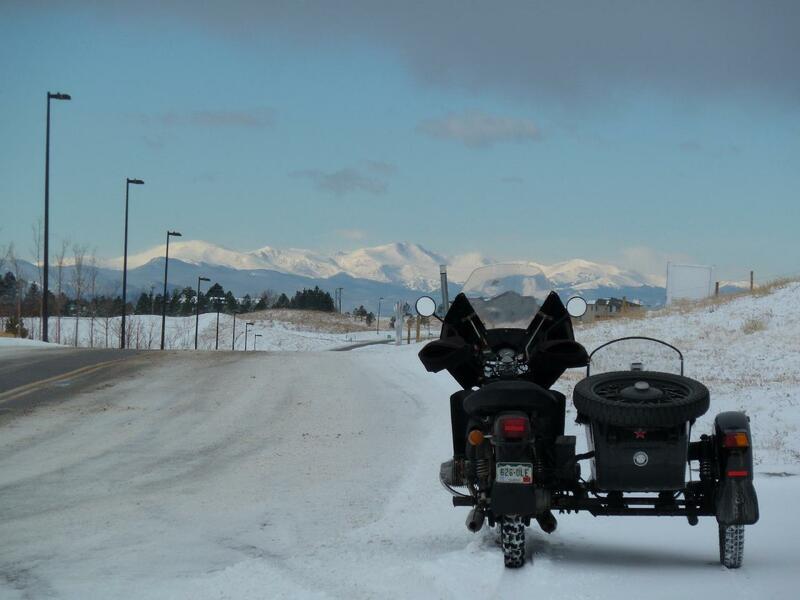 It's 2.5 hrs of Ural riding, with speeds in the 50s and mid-60s from my home in Centennial, CO, to Skyline Rode. The weather was warm and sunny and I found myself thinking I should have taken Brigitta, my R80 Beemer instead of Natasha. It would actually warm up to the point I had to shed all the warming layers I had on at the start of the ride! I didn't get home till way after sunset, its amazing how puny Natasha's headlight is. It's not just because I run a total-loss electrical system I believe. I remember thinking that even when the alternator was running, that the light seemed weak. Or maybe, it's my old eyes. Snowing today, though not much expected. 2-4 inches for today, 4-5 for tomorrow. Cut that in half, and you can see, not much; though I am sure it'll snarl traffic up nicely for Monday. Hope you got a ride in this weekend! The links are from an old car tire chain set I had in storage. The peaks seem close don't they, actually using the 12X optical zoom on my new camera. The main roads were mostly dry or drying on the way to Sedalia so I didn't expect the chains to hold up under that kind of conditions. Surprisingly, I only lost one of the four by the time I got to the Parker town limits. Soon enough though, the highways speeds needed on Crowfoot Parkway to Castle Rock caused two more of the links to break off and disappear by the time I got to Sedalia. Road conditions as you can see were not optimal for two-wheeled motorcycles; at least, not two-wheeled motorcycles ridden by yours truly! 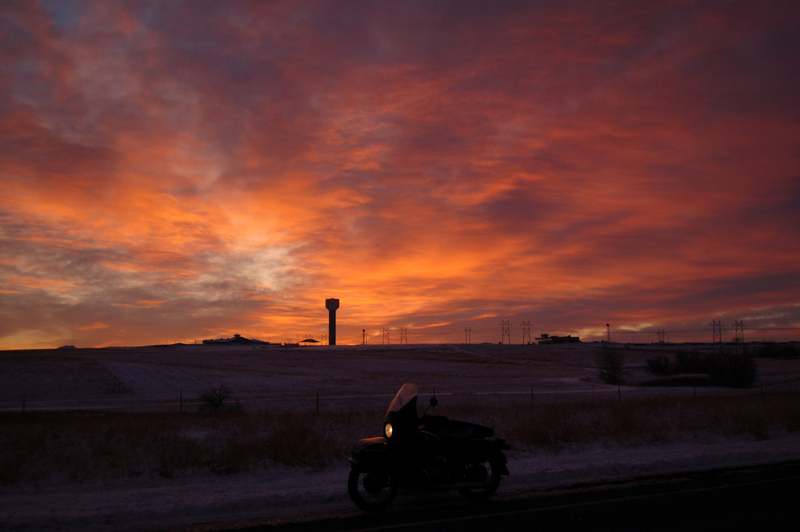 It's times and conditions like these where riding a Ural really comes in handy! Copying a shot angle I saw on everydayriding.org, thanks for the idea Chris! note I still have one remaining zip tie/chain on the front wheel, amazing. there was a barrier stopping traffic further past the curve in the picture. I retraced my route, heading back towards Sedalia on CO 67. 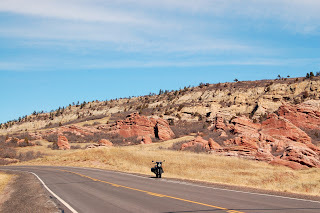 Once I exited from Jarre Canyon Road I turned right onto Oak Valley Rd and went looking for the turnoff for the county road that leads one to Bee Rock. It was now time to head northwest towards the town of Morrison to check out the Red Rocks Park and Amphitheater. I headed back through Sedalia where I picked up northbound US85 until I was able to get on the C-470 super slab westbound. 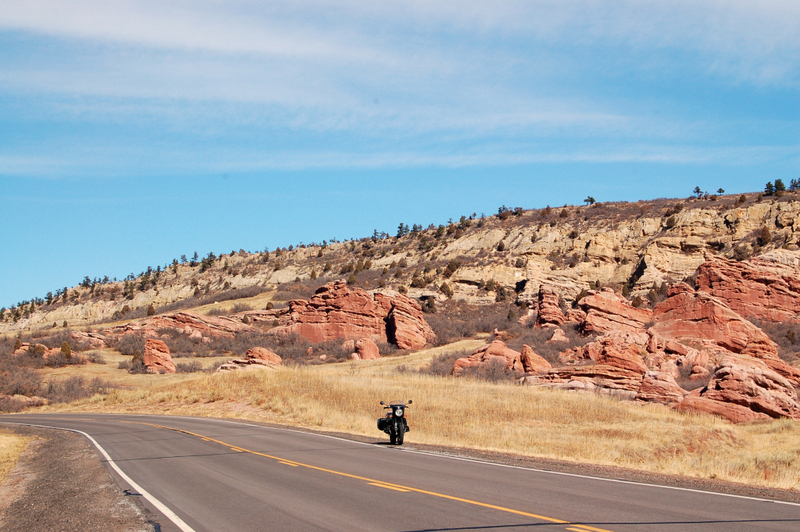 Soon enough I was cruising through Morrison (not a single motorcycle in sight, go figure) and I arrived at Entrance #3 for the Red Rocks Park. Note, I lost the last chain link somewhere on C-470, pretty good performance I must say, of those zip ties. I hope you enjoy the following video ride through the park. It was a total of 24 minutes long but I edited out all the not-quite-so-interesting bits. Soon after I exited the park, I was homeward bound using Morrison Rd to get me to Kipling which I took south to US285. From there it was light city traffic all the way to the I-25 to I-225 interchange. Parker Road came up a bit afterwards and I was home by 3:00 PM or so. A bit cold to be riding today but my gear kept me warm enough, specially when the sun shone down upon me. When riding under overcast skies and at highway speeds, I could feel the chill start to seep in on my arms which are exposed to the wind, still, not bad. Hope you got some riding in today!